Oh, how I do love Neil Gaiman. 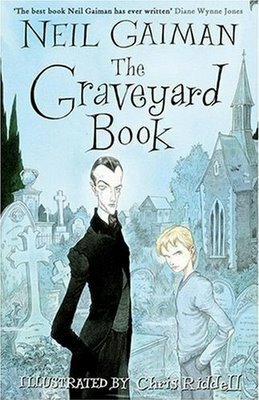 I read The Graveyard Book more than a year ago and adored it then, but I decided to choose this book as my first selection for an online book group that I run. We read it in October and I thought it would make a spooky and fun read as we approached Halloween. It was such fun to come back to this book. I love the illustrations by Chris Riddell, I found it added a little more atmosphere to the story. I didn't know beforehand that Neil Gaiman took inspiration from The Jungle Books by Rudyard Kipling, but instead of a jungle, he placed his main character in a graveyard raised by ghosts. I think it's an interesting twist, handled very well. The story is that of a young boy whose family is murdered by a mysterious man in black. The boy is able to escape, and finds refuge in a graveyard. The ghosts in the graveyard decide to let the boy stay and he is adopted by The Owenses and called 'Nobody' - Bod for short. As Mr and Mrs Owens are not able to leave the graveyard, Silas is appointed his guardian. Silas is neither living nor dead, but is able to bring Bod clothes and food and information from outside. Bod grows up, doing his best to learn history and his letters from the ghosts around him. As Bod grows up, he soon realises that he is in danger and must face this man in black if he is ever to stand on his own and become a man. What I love most about The Graveyard Book are the characters that we meet. Bod has a wonderful enquiring little voice. Brave and curious and quick thinking. But it's Silas who stole the show for me. Never directly named as a vampire but the reader is given small hints. Silas puts himself in harm's way in order to protect young Bod. Then there's Miss Lupescu, a Hound of Hell, who looks after Bod occasionally and teaches and protects him. There's Liza Hempstock, the witch-ghost. Each character teaches Bod what he needs to know in order to stay alive, to survive when the Man in Black arrives to finish the job that he's started. The bit in the product description is fantastic, about Bod learning about life from the dead. It's an interesting concept and one that Neil Gaiman pulls off wonderfully with this book. The visuals, especially of the woman on the gray horse and that of the Danse Macabre are images that will stay with me for awhile. The Man in Black, and his associates the Jacks are wonderfully sinister villians and this really does make for wonderful reading for anytime of the year. I didn't know about the jungle book twist. What a brilliant idea and it makes sense now that you mention it. I loved this one too! I thought it was a brilliant way to reimagine The Jungle Book. It seems Gaiman can do no wrong. Vivienne - It took someone else to point it out to me before I saw it! I wouldn't have noticed the Jungle Book parallels if Gaiman hadn't mentioned that's what he was doing. I've read Kipling's Just So Stories, but never the Jungle Book, at least not so far. I absolutely loved this book, and I had no idea that it was inspired by The Jungle Book. Jenny - I haven't read The Jungle Books either, they never really appealed to me! Zara - It was only in the comments of our blurbing book club discussion when someone else mentioned it, otherwise I'd never have known either! Tammy - No Gaiman books ever? Oh dear. But wahey, I think this is an excellent starting point into Neil Gaiman's work! Any of his children's books, this, Coraline, Stardust. All very good. Then dip into the adult books. I haven't made it to the graphic novels yet. ANd yes, he does write excellent characters! I'm really excited to read this book- I read the short story "The Witch's Headstone" in M for Magic earlier this year, but I haven't been able to read the actual book yet! Stupid school.